Lincoln School was built at a cost of $8,500 on three lots donated by the St. Louis Park Land and Development Company: 5925 W. 37th Street at the corner of Alabama. The school opened January 6, 1890, with James T. Davis as Principal. The school district and the village council split the cost of the building, and the Village Council held its meetings on the second floor. In 1938 Lincoln School building was decommissioned as a school and was sold to the Village for $1 to become Village Hall. Prior to that time, Village records were stored at the homes of various officials. Other tenants of the building were the Hennepin County Historical Society (1938 – 1944), Rural Hennepin County Nursing Society, and again an elementary school from 1944 – 1947. A police and fire barn was built next to the building and the two buildings were connected by a tunnel. Mary McElmurry, daughter of Fire Chief Pete Williams, remembers: “There was a really heavy, thick steel door connecting the two of them right off the kitchen of the fire barn. When I was younger, it was too heavy for me to open and I had to have someone help me with it. Such memories. In 1958 history-minded Earl Ainsworth collected the portraits of the former Mayors of the City for display in City Hall. In 1960, a plaque was placed, reading “Portraits Provided by S. Earl Ainsworth, St. Louis Park’s Distinguished citizen and Public Servant, 1958.” We think the original portraits ended up at the St. Louis Park Historical Society. Copies are again displayed in the council chambers at City Hall. An article from 1961 describes the building as a fire hazard that sways in a hard wind, with a floor that ripples like waves on the ocean. The building was built in two sections that separated in a big wind. In 1960 the City purchased a 16-acre area (five sites, Collins 2nd Addition) at 37th and Highway 100 from Hennepin County, and the Planning Department proposed that it be used for a Civic Center, featuring an open fountain surrounded by public buildings such as the City Hall, Library, and a Municipal Auditorium. 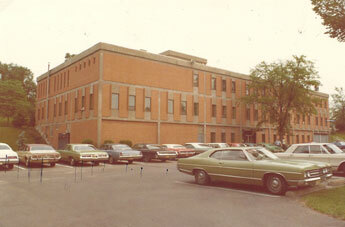 The campus would also include a recreation center, police, and fire departments. Brandhorst and Leadholm architects had already drawn up some sketches. But when Interstate Department Stores of New York offered $440,000 for 10 acres of the property, the City determined that the profit could be used to fund a City Hall at another location. The area bordered by Louisiana, Gorham, and 2nd Street. In 1939 Park Theater developer Harold Field purchased 27 acres of land from farmer Simon Kruse. Field donated 10-15 of those acres for Carpenter Park, named for B.W. Carpenter. Since the land had been designated as park land, Field had to sign a release in order for the City to build. The site of Carpenter Park was the property of M. Parry in 1893; he owned the entire tract that includes the Park Theater Building, the Garden Village Apartments on Raleigh, the condos at 5101 Minnetonka, Skippy Field, and Menorah Plaza. 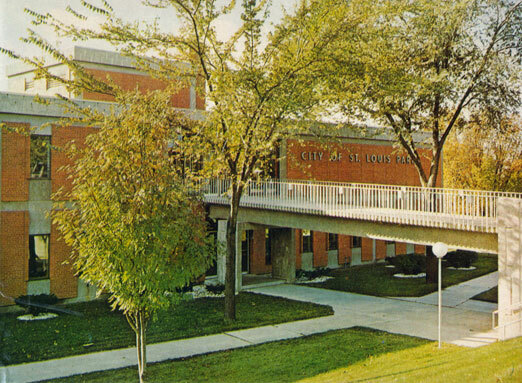 On December 21, 1961, the City Council chose the Carpenter Park site for its new City Hall. Construction cost $170,000. It was completed and occupied by city staff on October 18, 1963. 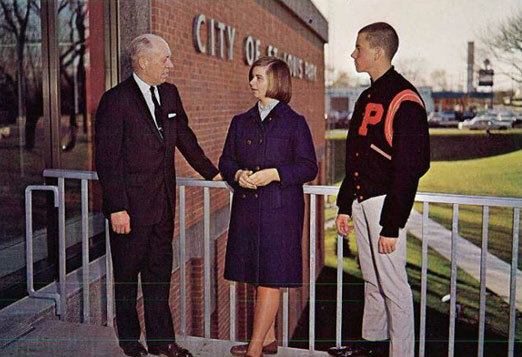 The City Jail was designed by Austin Lange, Architect and built by Pauly Jail Building Co. A dedication dinner was held in the Council Chambers on October 30, 1963. As a result of this and other purges, City Hall has few records older than the 1950s. 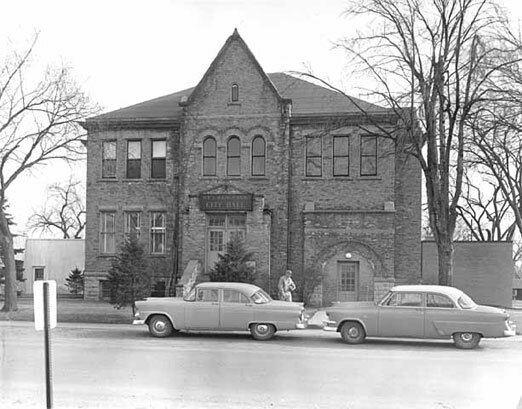 In 1966 the Lincoln School/Village Hall building was sold to Minnesota Rubber and then demolished. In 2014 City Hall was renovated to update meeting rooms and provide more public space.